About a decade ago British travel writer Tim Moore wrote one of the all-time great cycling books, ‘French Revolutions’, in which he sought to traverse the entire route of the 2000 Tour de France. Not content merely to ride the 3,000km+ course, however, he also set out to pay homage to the race’s history by replicating as much as possible the conditions experienced by riders from the race’s past. On one particularly memorable and hilarious stage he decided to drug himself up to the eyeballs (I think it was antihistamines but can’t remember exactly), to see if it helped his performance on the bike. Pretty sure it didn’t. Part travelogue, part history lesson, part comedy, if you haven’t read French Revolutions yet, well, you really should. 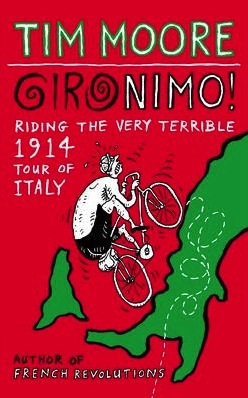 Because Moore has now written a sequel, Gironimo!, focusing on the second most famous stage race in the world – the Giro d’Italia. It comes out on May 1st, perfectly timed for the 2014 Giro. If it’s anything like its predecessor, prepare to laugh out loud.